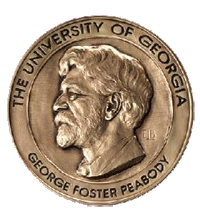 The Quick and The Dead garnered a 1951 Peabody Award for Radio as an Educational feature. The post-World War II years were bittersweet. Still flush with the anticipation of a far better--and safer--world, that anticipation was tinged with the harsher realities of the dawn of the Atomic Age. The awesome power of atomic energy was still viscerally fresh in the minds of everyone on the planet that had seen, read, or heard of the devastation at Hiroshima and Nagasaki. And yet at the same time that civil defense preparations were being quietly, yet diligently undertaken throughout the world, nuclear energy proponents and industries were beginning to wage an all hands on deck public relations campaign to explain the promise of nuclear energy. An admittedly tough sell to a world almost universally unsophisticated in their understanding of both the dangers and promise of nuclear energy. And yet that was precisely the task set before the proponents of peaceful uses of nuclear energy. There were still far less proponents of nuclear energy than critics of the awesome new technology. It hadn't helped the P.R. campaign that every detail in the development of nuclear fission had been shrouded in the greatest military security ever before mounted in the history of mankind. 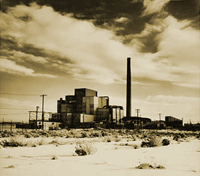 As some of those details--and the technology and science behind them--were slowly revealed to an anxious world, the very need for the extraordinary cautions exercised in bringing the first demonstrable use of nuclear energy to the world simply served to underscore the new energy's horrendous cost. The even harsher reality was that there was no turning back. 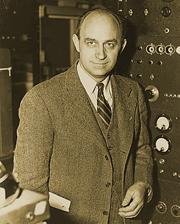 Within a year of the inauguration of the Manhattan Project, German scientists had already begun to develop their own nuclear fission technology. In the aftermath and chaos of World War II, our former ally Russia was racing to gather up as many of the German scientists who'd been developing nuclear technology for the Nazis as our own Government. The arms race was on. But at the same time, those closest to the technology were absolutely ecstatic over the possibilities promised by successfully harnessing nuclear energy for peaceful purposes. Through print media, Radio and early Television, our government was attempting to mount history's hardest sell. Radio was still the most readily accessible medium during post-War America and that's precisely the medium that was targetted the most aggressively. The Atomic Age world needed to be educated and educated fast. But how much to reveal? The technology was still understandably held under the tightest secrecy--even more so since the dawn of the Atomic Age had broke with such devastating results. The military-industrial complex had its own agenda and proponents of even more deadly uses for the new technology. Conversely, those hoping to harness the awesome new power had to sell the safety of the new technology to an entire world of understandly skeptical witnesses to the new power source. 1945 This Is Your F.B.I. 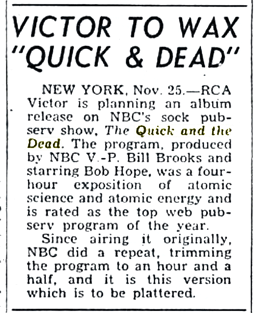 NBC's own carefully prepared contribution was The Quick and The Dead: A Document for Ear on Atomic Energy . Having learned throughout World War II of the persuasiveness of star power in attracting an audience to a message, NBC obtained the services of Bob Hope to host the mini-documentary. Many of the higher profile message series' of the cold war era found no lack of high-profile celebraties to front their presentations. Bob Hope was a particularly inspired choice. Presented as a four-part mini-series, documentary in format, the series sought to fully explain the background and history of nuclear energy, ultimately arcing to a presentation of the endless possibilities that the new technology afforded mankind. We say that Bob Hope was a particularly inspired choice for several obvious and perhaps less obvious reasons. 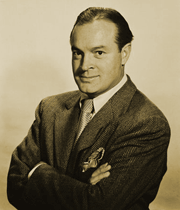 Bob Hope had become one of America's most respected and popular comedians, while at the same time having established an extensive resume assisting the Government throughout World War II, the Korean Conflict, and through his many bond drive appearances. Hope also had a knack for portraying the 'everyman' that NBC needed to act on the public's behalf in quizzing those who'd been closest to the development of nuclear energy--and who were allowed to finally speak about it. And of course, Hope's natural warmth and sincerity would serve to make even the dryest passages of the documentary both lively and natural. NBC--then CBS--legend, Fred Friendly was tasked with writing, producing and directing the project. Friendly and NBC news legend in his own right, Bob Trout, had previously teamed up with NBC on a novel topical news quiz format for NBC, Who Said That? 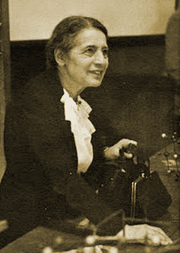 (1948). 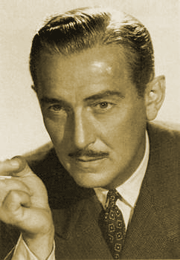 So when it came time to go to the well for assistance with The Quick and The Dead, Bob Trout became the series' anchorman for many of The Quick and The Dead's newsroom-type segments. But how to present such complex and still secretive information? Friendly's approach was to have Bob Hope act as an avidly curious 'everyman' seeking to learn as much as was then capable of being imparted regarding the development of nuclear energy. The format had Bob Hope seeking help with his understanding of nuclear energy by enlisting the help of NBC's newroom in the form of Bob Trout. Trout suggested that Bob consult another newsman who'd been in the enviable position of being on-scene thoughout the earliest years of the secrecy-shrouded Manhattan Project. Trout introduced Bob Hope to William Laurence, a two-time Pulitzer Prize winning Science Correspondent with The New York Times. William Laurence had been one of a mere handful of science and technology correspondents discretely drafted by the Army to cover the story of the Manhattan Project. 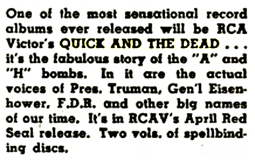 In that context, The Quick and The Dead becomes as much William Laurence's fascinating story as much as the development of nuclear technology that he secretly covered for three years--unquestionably the biggest news story of the 20th Century. For the remainder of the four-part series, Bob Hope and William Laurence engage in a two-hour long conversation regarding the history of the atomic and hydrogen bombs and the technology behind them. The first two installments of the series treat the development of the atomic bomb and the earliest history of nuclear energy. 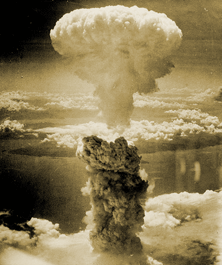 The final two installments addressed the development of the hydrogen bomb and the technologies it spawned. Hope and Laurence's conversations are aided by mini-dramatizations and new spieces by Bob Trout to provide perfectly punctuated breaks in Laurence's narrative expositions. The four-part series is full of fascinating vignettes about the background and development regarding the biography of the atom bomb. To keep listeners coming back for the next installment, Bob Hope closed each of the first three parts of the series with a warmly worded request to keep coming back for the remainder of the story. Friendly's writing and direction were masterful throughout the series. The task of disassembling the complex and secret history of the subject matter had to have been daunting in itself. Friendly was also tasked with making the four-part series engaging and interesting to an unprecedented range of potential listeners. 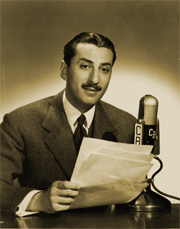 Fred Friendly had worked with Edward R. Murrow on their ground-breaking, I Can Hear It Now series. Friendly incorporated one of Radio's first extensive use of news 'clips' interwoven into Murrow's documentary pieces to give unprecedented gravity and first-person visceral appeal to the I Can Hear It Now programs. The experience served Friendly well in directing and producing The Quick and The Dead. Throughout the four installments, Friendly skillfully and creatively intermixes both recorded and reenacted news pieces to punctuate and underscore the gravity of each juncture in the series' scripts. 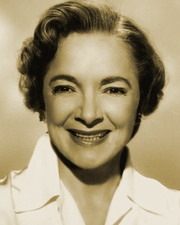 The production was also aided by the talents of Helen Hayes and Paul Lukas performing several of the dramatizations in the series. Friendly also employed actual interviews with Paul Tibbets, the command pilot of the Enola Gay, Robert Oppenheimer, the 'father' of the Manhattan Project, General Leslie Groves, the Army general charged with the logistics and security for the Manhattan Project, and David Lilienthal, the Chairman of The Atomic Energy Commission between 1947 and 1949. The inevitable payoff for the series comes in Episode No. 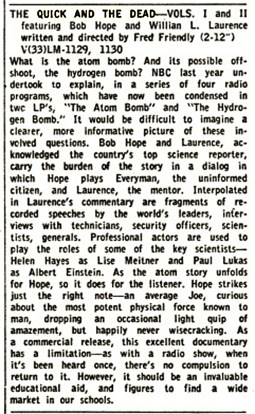 4, a discussion of the miraculous new applications of nuclear technology, already in use as early as 1946. From nuclear medicine treatments of cancers to harnessing nuclear energy for energy creation and propulsion, the promise of nuclear energy and technology is thoroughly explained and explored in layman's terms. The applications for nuclear medicine are most thoroughly explored. Nuclear propulsion and energy generation were still highly secretive technologies in 1950. 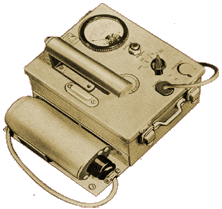 But the promise of nuclear medicine alone seemed--and was--a miracle in 1950. "Education in recognition of the success of this series in simplifying and dramatizing a difficult technical subject and in dwelling on the good as well as the evil that lies in the conquest of nuclear energy--with a special word of praise for William Laurence of the New York Times, who brought to this program a wide knowledge and long experience in popularizing science; and for Bob Hope and the players who interpreted the drama of the Atomic Bomb; and for William F. Brooks and Fred Friendly of NBC for their behind-the-scenes planning." The applications of and for nuclear technology have expanded exponentially during the ensuing sixty years since this series was originally aired. And yet the misunderstanding about the technology's origins and history remains full of lore and myth in the 21st Century. As misunderstood today as it was in 1950, nuclear technology remains shrouded in revisionist history, political fear-mongering on both sides of the argument, and debated even more hotly sixty years hence as it was in 1950. This series is both a cautionary tale and a tale of hope (small 'h'). Depending on one's viewpoint, the application--and potential abuses--of nuclear technology today remain just as confusing as they must have been in 1950. Perhaps even more so today, due to the dramatically different political climate of the 21st Century. William Laurence spun a marvelously and infectiously animated tale of the wonders of nuclear technology. It's impossible to hear this mini-series without coming away with a fuller understanding of the technology in terms any layperson can readily understand; certainly a refresher course on the issues at the very least.. Bob Hope's basic humanity in reacting to Laurence's natural exhuberance in his narrations and expositions is both touching and familiar. High praise must go to sound engineer Bill Shwartow for a wonderfully seamless and beautifully knit combination of news bites, interviews, underscore and sound editing. The series is quite simply brilliant. It was then, and it remains so now. 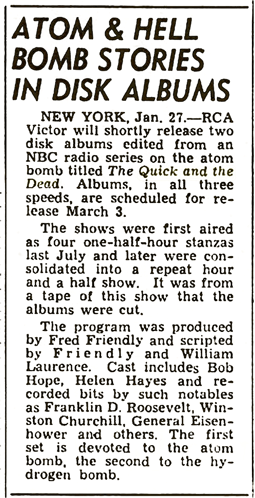 Run Dates(s)/ Time(s): 50-07-06 to 50-07-27; NBC; Four, 30-minute programs; Thursdays, 7 p.m.
7 p.m.--The Quick and the Dead (WIBA): new series on atomic energy program, with Bob Hope as average citizen; Helen Hayes as Dr. Lise Weitnet, German scientist; Paul Lukas as Albert Einstein; crew of Enola Gay, first A-bomb plane. 7 p.m.--The Quick and the Dead (WIBA): dramatizing creation and use of atomic bomb; William L. Laurence tells story of preparations to Bob Hope; Co--Pilot of Enola Gay reads log of Hiroshima attack; other crewmen tell their stories. 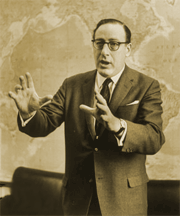 7 p.m.--The Quick and the Dead (WIBA): William L. Laurence tells Bob Hope about H-bomb, discovery of Russia's possession of A-bomb, Klaus Fuchs' arrest. 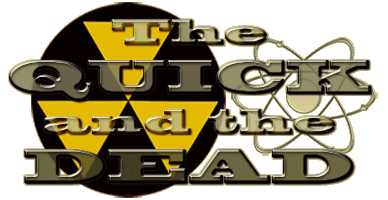 7 p.m.--The Quick and the Dead (WIBA): William L. Laurence tells Bob Hope about peacetime uses of atomic energy.